David and I have been talking for years about when the time would come for us to be able to take the girls skiing out west. 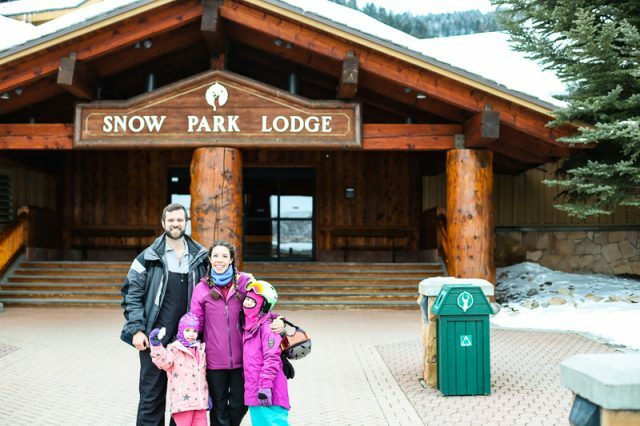 We had a test run last year at Snowshoe in West Virginia and felt confident that this year we were ready for a family ski trip to the Rockies! 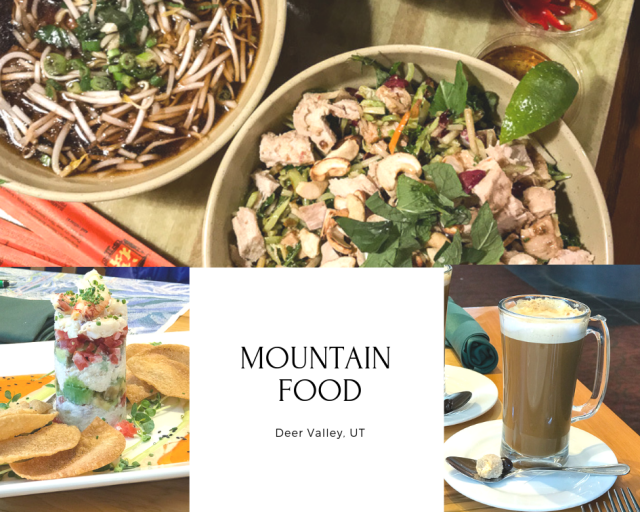 We looked for places with direct flights from Charlotte and a short commute upon arrival and decided flying into Salt Lake City would be our best bet. I grew up skiing out west about once a year (thank you Mom and Dad! 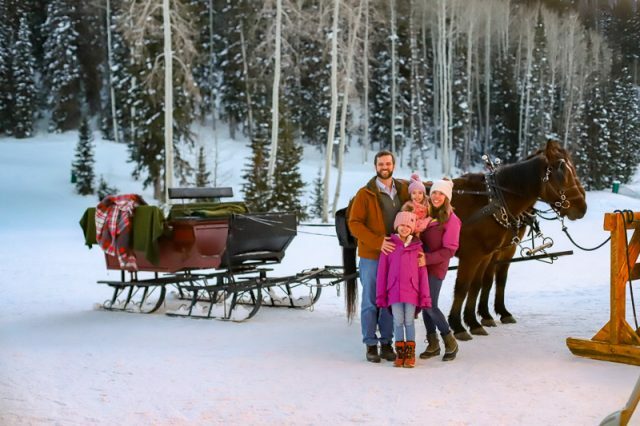 ), and had been to Deer Valley a couple times and just felt it was a great family spot. We booked the flights, found a condo to rent, and the trip was on! 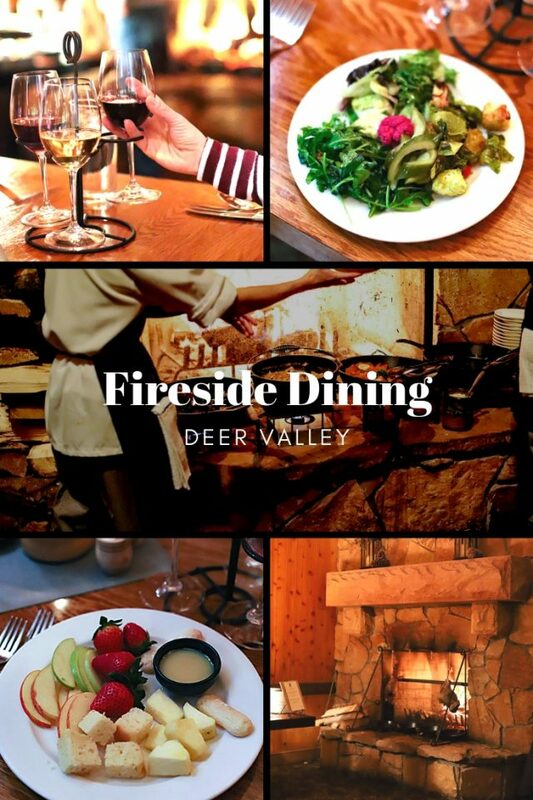 We reached out to Deer Valley and they offered us lift tickets and dining vouchers for our stay when I told them I’d be sharing our experience. As always, opinions are my own. 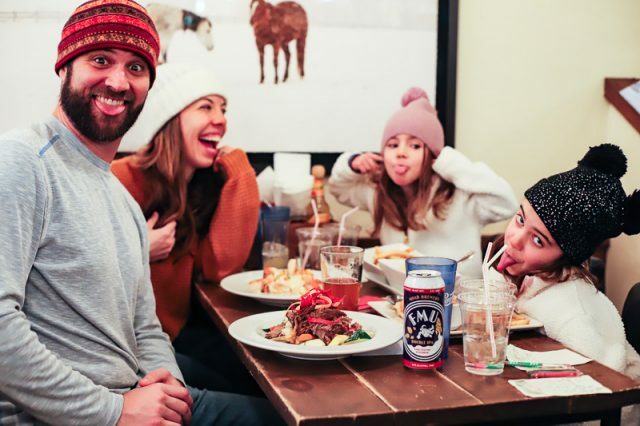 This Deer Valley ski vacation was one for the books for us. 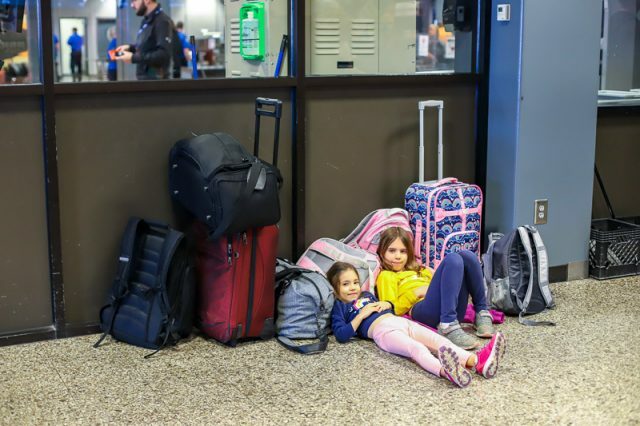 I’m not sure if it was the fact that the girls have gotten to really great travel ages (7 years old and 4 1/2) or if it was one of our most adventurous family trips to date, but we will be talking about this vacation for years to come. Perhaps with the fact that this was Kaitlyn’s first time ever being on a plane and Hailey’s second (but the last time she went she was only one). That in itself was enough to make us all giddy. Our plane left at 7:30 AM, which also meant we got the excitement factor of waking everyone up early. The enthusiasm carried us through just fine. The girls ate bagels in the car and were ready to go by the time we arrived at the airport. Security took longer than we anticipated (doesn’t it always), so when we arrived at our gate, we walked right onto the plane. That’s about 45 minutes tighter than I like to cut it, but we made it and it all worked out. Each girl had packed a backpack with notebooks, crayons, books, etc, but not a single item was touched because apparently Delta has screens on the back of every seat with a special “kid zone” section packed with TV shows, movies, music, and games. Since we are typically once-a-weekers with screen time, the girls were straight up giddy and we let them just go for it. Needless to say the flight went completely smoothly (even with bathroom breaks because the girls are big enough to go in those tiny bathrooms solo!) and the we were all surprised how quickly those 4 1/2 hours flew by. We booked a car to pick us up at the airport and drive us to Park City, which was about a 30 minute drive. It passed quickly as we all gawked at the mountains the whole time looking for moose (which none of us ever saw). 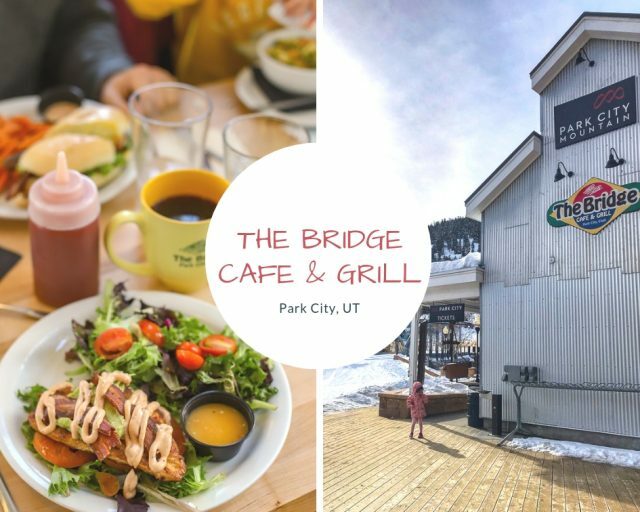 Knowing we had time to spare, we stopped in Park City (about a 5 minute drive away from Deer Valley) to find lunch. Hungry kids dictated that we stop at one of the first places we stumbled across, The Bridge Cafe and Grill. It ended up being a great spot to collect ourselves, warm up, get some grub, and watch skiers come down off the mountain. We were still too early to be able to check in at our condo, but luckily had the access code to be able to drop off our luggage. When our uber dropped us off we were thrilled that the promised good location of our accommodations were accurate- closer than the parking lot to the resort/base of the mountain/ski school and directly next to the Funicular that takes you up the mountain to The St. Regis Hotel. Our first order of business was to get out ski equipment, so we walked the 50 yards to the resort and found our way to the rental shop. Immediately I began to see evidence of why people say Deer Valley is “next level” in terms of service. Every employee just seems happy to be there and happy to help. They whisked us to the benches to immediately get us fitted for skis and I just have to give a personal shout out to Ben, an incredibly kind man that not only helped fit the girls for boots and skis but also chased them around and tickled them, citing his role as “experienced grandpa” for knowing just how to entertain kids. We were in and out of there in a jiffy. We still had time to burn before check in, so we decided to ride the funicular (a mountain rail car) up the mountain to check out The St. Regis. Not only was the ride and view thrilling for the kids, The St. Regis has a complimentary afternoon hot chocolate bar that is not to be missed. Hot chocolate, whipped cream, chocolate shavings, marshmallows- the works. We could have called vacation over right then and the girls probably would have said it was the best trip ever. 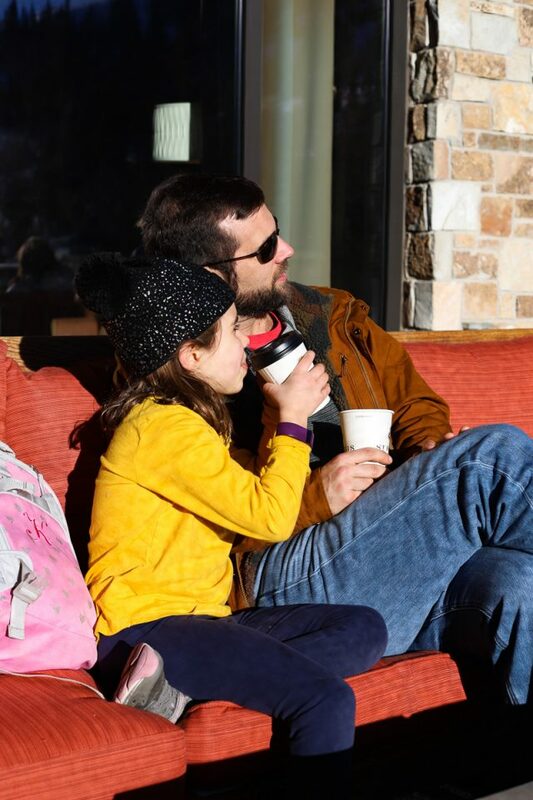 We sat outside on the sofas by the open fire pit and watched skiers come down the mountain and right into the hotel while sipping hot chocolate. It was unreal. Finally 4:00 arrived and it was time to get into the condo. We had used the local service, Grocery Girls, to order breakfast items, snacks, and drinks ahead of time and was fully stocked when we arrived to check in. The condo we rented was more spacious than I was expecting, and though there were a few things off like a half-painted wall in the bathroom and a bathtub that wasn’t able to be plugged, the wood-burning fireplace, clean hot tub on the deck, roomy interior, and supplied Lego box made it a fantastic spot for us to spend our week. With the time change, a two hour difference for us, we knew we were on borrowed time with the kids and wanted to eat dinner on the early side. We walked to The Brass Tag for a 5:30 dinner and were pleased were glad we made the choice to go on the early side. We beat the dinner crowd and they had engaging coloring sheets for the girls, so we enjoyed a great first meal and celebratory martini to kick off the vacation in style. We all crashed hard that night… well, until Kaitlyn came into our room at 2:30 AM claiming she couldn’t sleep. Since we had a king, I let her crawl in with us (another vacation treat!) and we all surprisingly slept decently well until 6:00 AM (8:00 AM our time). We got up, I made breakfast and made tea, then we slowly started getting on all our layers so we could allow ourselves plenty of time to figure out the ski school situation. Let me be real honest here- staying warm takes a lot of layers for little kids and the morning process isn’t exactly joyful. Every morning was a battle of smoothing out fabric layers, scratching itches buried beneath ski bibs, and fighting between I’m to hot (go stand on the porch) and I’m too cold (come back in by the fire). We found the faster we could get them out the door, the faster the whines faded. 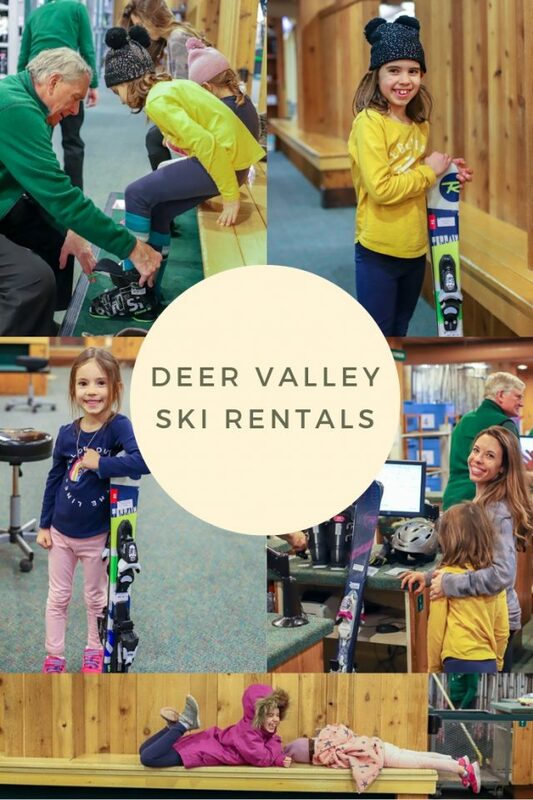 Since Deer Valley offers complimentary overnight ski boot and ski storage right at the base (which is incredible! ), the short walk in regular boots was a breeze. I’m glad we had on regular boots, too, because it ended up taking us a while to figure out exactly where to get the kids and when for ski school. The funny thing is that it is actually a super simple process and took all of 5 minutes on day two, but on day one we ran around the maze of a lodge quite a few times trying to gather equipment and find out where each child belonged. But it was SO worth it because once David and I dropped the girls, we were free to hop on the lifts and go explore the mountain! 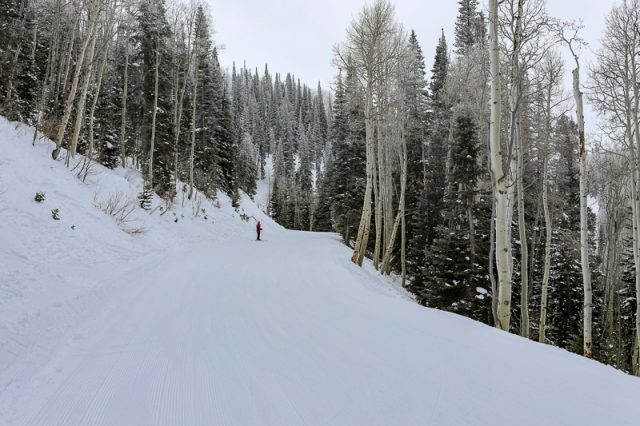 There were a few things that immediately stood out to me that were special about Deer Valley: no lift lines, ever, plenty of opportunities to ski through trees, and friendly employees everywhere. Oh, and the views weren’t half-bad either! We did a few short runs, then, knowing the girls would be out in the beginning ski area in the morning, circled back to the base to peek in on them. 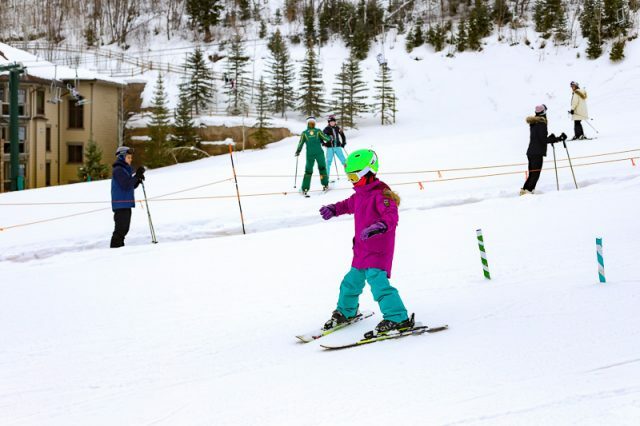 Deer Valley has a great ski school area at the base with several magic carpets, and two very easy, beginner lifts. Both that and their limited child to teacher ratio probably contribute to their reputation as one of the best ski schools in the US. It was easy to spot the girls (bright green rental helmets!) and we got the biggest kick watching them learn and practice their edgy-wedgies down the bunny slope. After ensuring they were doing just fine, David and I took off to explore the mountain. We are mostly blue run skiers, which is wonderful because there are greens and blues all over the mountain in Deer Valley. I was fortunate to grow up skiing out west once a year (shout out to you guys, Mom and Dad!) so skiing for me is like riding a bike- one run down and it all comes back. 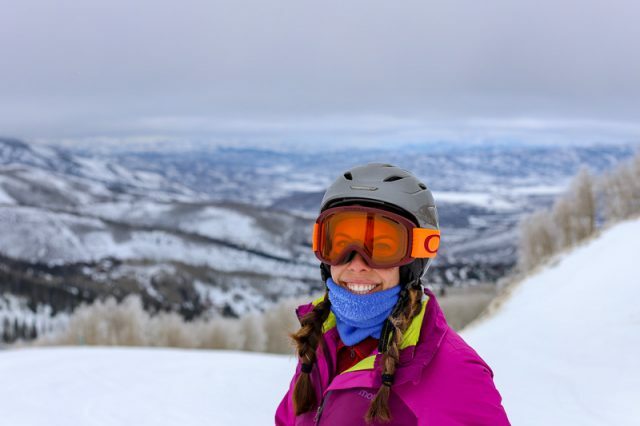 With the girls in ski school, we spent the day exploring the mountain, warming up with almond milk lattes and elk chili (the mountain food at Deer Valley is seriously impressive), and just enjoying the scenery and fresh air. It felt like a day-long date! We headed back to pick the girls’ up at 3:45 and were thrilled to be met with such happy faces! Kaitlyn was in the “Bambi” program which meant she skied for 2.5 hours in the morning, then came in for lunch, a craft, and a movie. Hailey was in the “Adventure Club” which mean she had a morning and an afternoon ski lesson. 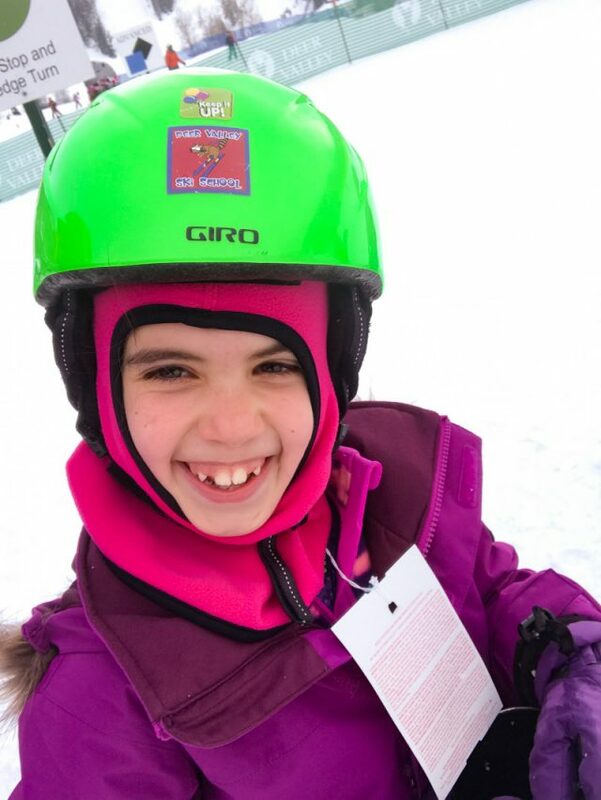 One of the perks of ski school is getting a personal report card at the end of the day so we could read what they were doing well with and what they were practicing. It was the cutest! We cautiously felt out how the girls were feeling after a full day of new activity, but in short, they were great! 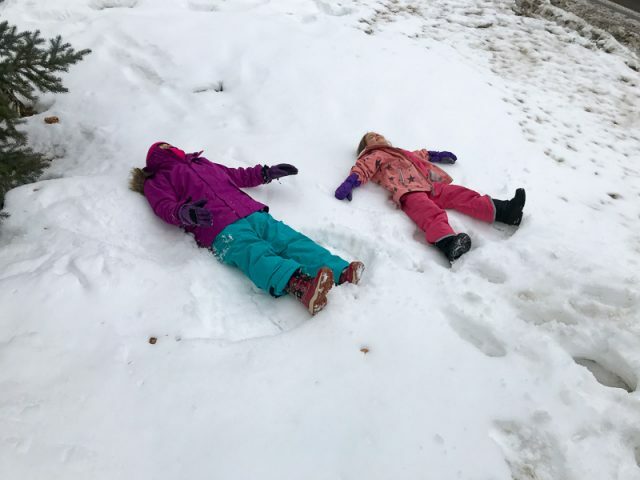 They were excited about their day and still had plenty of energy on the walk home for snow angels. We all hopped in the hot tub once we got back to the condo, the girls with apple juice, David and I with waters, a beer, and a glass of wine respectively (which ended up becoming a daily ritual). 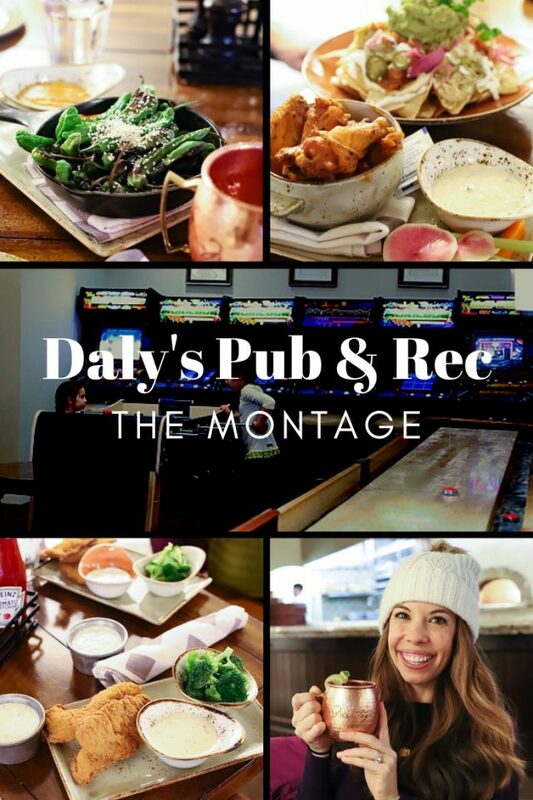 Seeing that their spirits and energy were good, we decided to Uber over to The Montage to have dinner in Daly’s Pub & Rec. Friends had told us it was a great family spot because they had games for the kids and good food and drinks for the adults. They were spot on! Not only was the drive to the well-known and fancy hotel gorgeous- the trees along the road in were all lit up and sparkling, the dinner spot worked out perfectly for our crew. The girls were entertained with foosball and David and I got sit, relax, and take it all in. The next day had a very similar set-up, though ski school drop off went a million times more smoothly. David and I took off up the mountain again, but still ended up swinging by to spy on the girls in ski school; it was just too cute not to watch. 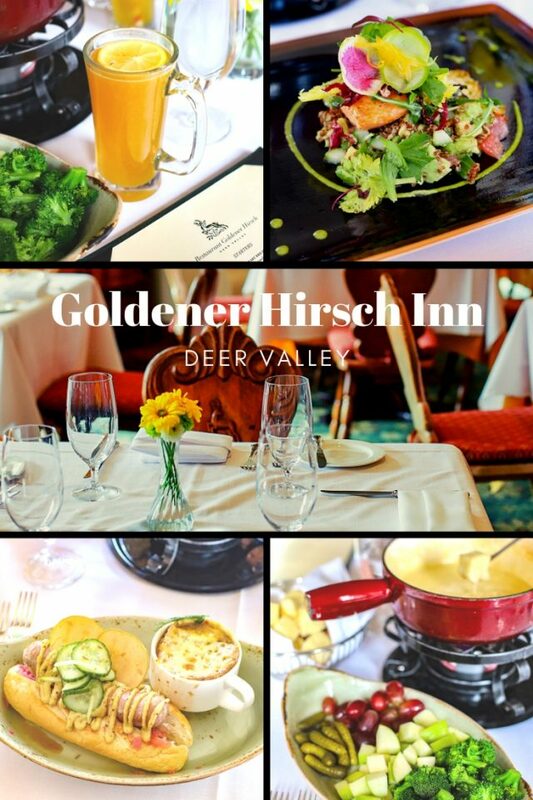 Since it was our last full day with both girls in ski school, we had a lunch date at the very swanky Goldener Hirsch Inn, which is easily accessible from the slopes. We had looked it up and knew it was nice, but had no idea to what degree. It’s a AAA-Four Diamond restaurant and we soaked up every minute and bite of it! 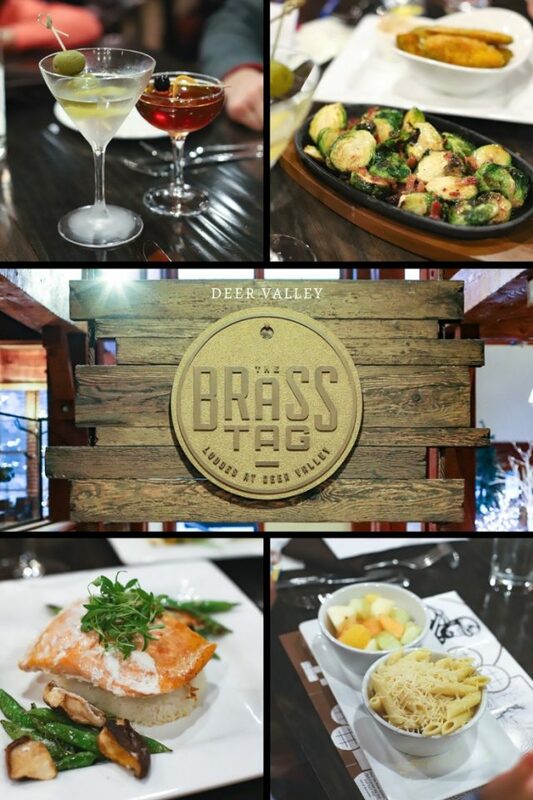 Having the full day of skiing coupled with a fancy lunch together was so great. We love being together as a family so much that sometimes we might sacrifice doing things just as a couple, so this was a real treat and will forever be a special memory for us. We made it our goal to really ski hard that afternoon to take advantage of our last time on the mountain just the two of us and by the time we picked the girls up from ski school, my quads were burning! We stayed close by for dinner that night, walking up to the Seafood Buffet at Snow Park Lodge. I was trying to keep my eyes open at this point, but the girls completely lit up. It ended up being Hailey’s favorite meal of the whole trip, as the wide variety of options and unlimited courses really spoke to her. She (and Kaitlyn too for the most part) wanted to try everything, so we did! We devoured bites of crab legs (a favorite), poke bowls, snapper, gumbo, salad, ribs, and more. I slept like a log that night, which was necessary because the next day we took on the mountain together as a family. Wow, that was… shall we say… something? 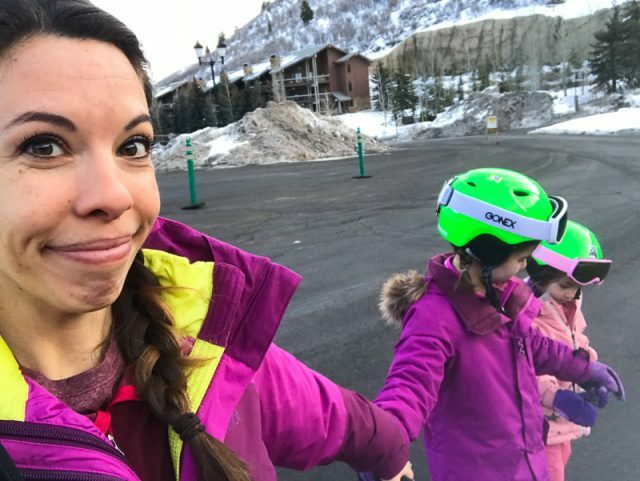 The girls were excited to all go skiing together and Kaitlyn was giddy about going on her first lift, but the mornings were cold, especially higher up on the mountain, which was tough on them. We started Kaitlyn on a harness that a friend had lent me, but she wasn’t quite at the point of being able to control her speed so she ended up just continuously falling backwards. We snapped a picture on our favorite run to prove we all did it together, but the David and I were whispering back and forth at our mid-mountain warm-up about how ski school is worth every penny. I joke just a little with this because luckily after lunch we did better. It was a little warmer and Hailey had gotten into her groove quite well. David and I took turns skiing with Kaitlyn between her legs, which I’m not sure was helping her learn, but she enjoyed it and it helped us to move around the mountain with more ease. Still, at the end of that day we signed Kaitlyn up for ski school again, figuring it would be best for everyone. 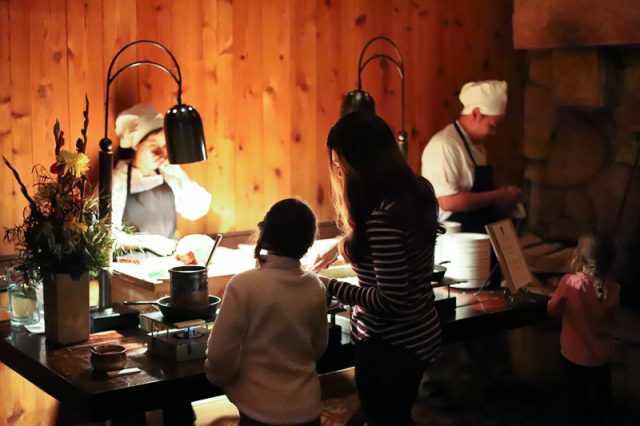 That day’s post-ski hot tub was SO needed and luckily it rejuvenated us all for what turned out to be my favorite evening of the trip- the Fireside Dining Experience at Empire Canyon Lodge. We surprised the girls by arriving early for a horse-drawn carriage experience. I video-taped their reaction to walking out and seeing the horses, but I didn’t need to because seeing their little faces light up is etched in my mind; it was so sweet! It felt like a fairy tale, or as Hailey described it- like we were inside the Little House in the Big Woods book when Mary and Laura’s cousins come visit for Christmas! The ride itself was brief, about 10-15 minutes, and just around the base of the mountain, but we were bundled under blankets, our cowboy driver was so friendly, the horses were beautiful, and it all felt very magical to us. It was the perfect lead in to an incredible dining experience. At Fireside Dining they have these gorgeous, over-sized, wood-burning fireplaces and set each one up as it’s own serving station. 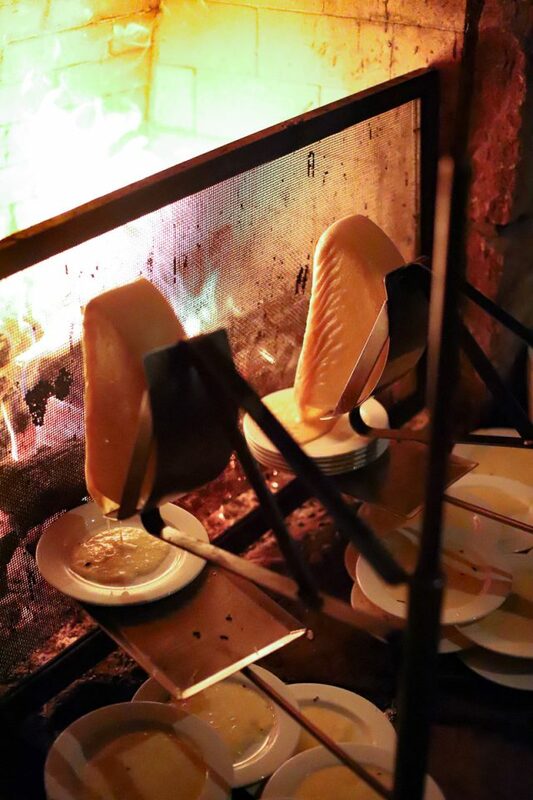 They have legs of lamb roasting in front of one, cheese slowly melting onto serving plates at another, and everything you can think of in between. Not only is the atmosphere beautiful and cozy, the food is fantastic. 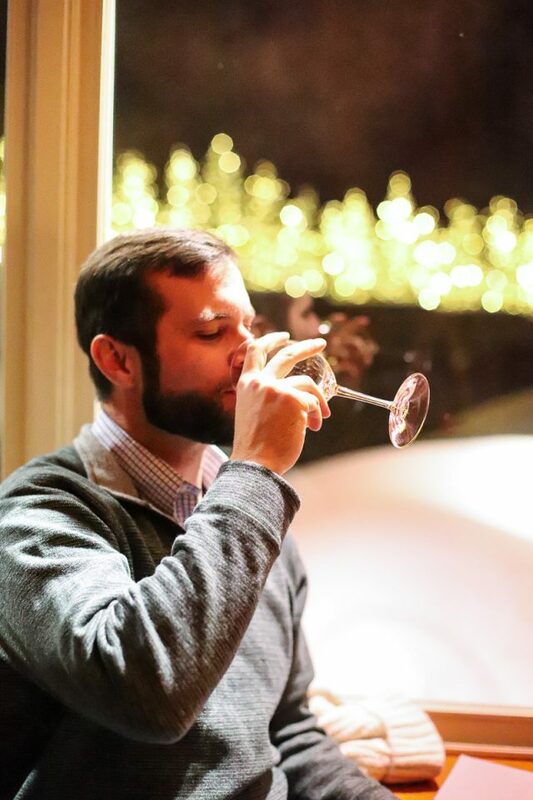 I’m not sure if it’s just the wine flight talking, but it was my favorite dinner of the trip. I think the relaxed but luxurious feel coupled with so many tasty food options helped seal the deal. 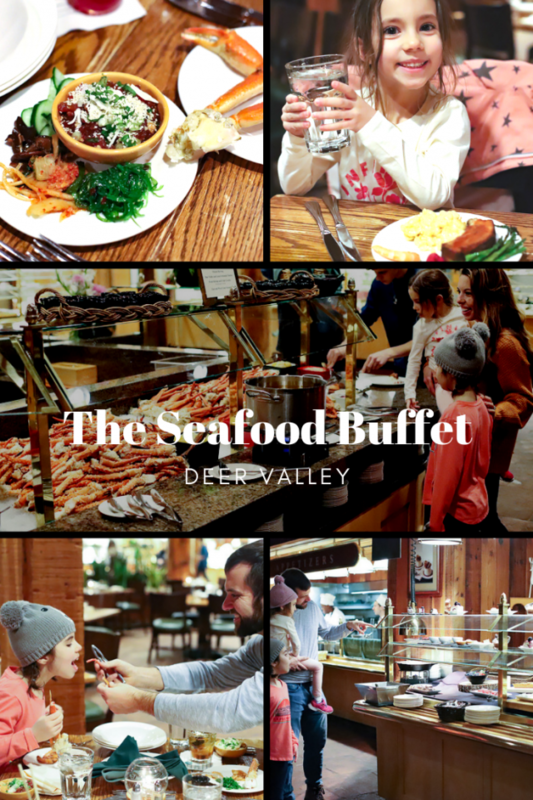 Plus, buffets are totally the way to go with kids. It worked out well for us that the girls could get up and move when they wanted to! We stretched that dinner out for all it was worth and I swore I wasn’t going to be able to eat again for at least 24 hours. Sunday morning we dropped Kaitlyn off at ski school and she seemed very happy about it. The morning ski lesson/afternoon craft and movie fit her well and Hailey was thrilled to have David and me to herself to take on the mountain. We warmed up a couple times on her absolute favorite life/run, The Judge, then took off to explore. Deer Valley has green slopes available almost on the entire mountain. Hailey had gotten to the point where greens were a breeze and she could even manage a few blues (though we didn’t tell her they were blues) so we really could access anywhere on the mountain. It was a ball! It made my mama heart burst to see how far she came in such a short amount of time. Kids are incredible like that and the instructors she had were top notch. It made skiing such an enjoyable experience for her, and for all of us. When we picked Kaitlyn up from ski school that afternoon, she was all smiles, which was a nice confirmation that we made the right choice. We decided that night we should actually go into Park City since we were so close by. 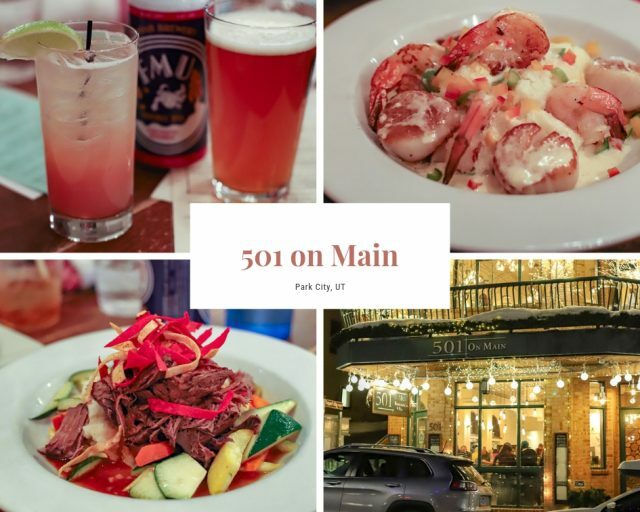 I had hopes to try Riverhorse on Main or Handle, but the level of exhaustion in the kids (ok, and in us, too) was legit, so we opted for something with a more casual feel and walked right into 501 on Main. It ended up being a great fit for us. 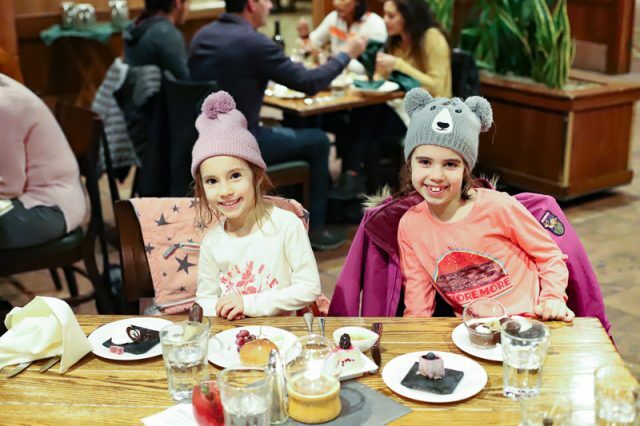 Casual, but good food, a bustling atmosphere where the kids shrieks blended at least a little bit, and decently quick service. We asked our waitress to take a family photo of our last night and the kids just were not feeling it. She took it upon herself to tell everyone to make a silly face instead, and go figure- it ended up being one of my favorite snapshots from the trip. We organized and packed everything that night, but since we didn’t have to leave for the airport until 2:30 on Monday, we squeezed in a little more time on the mountain as a family before returning our gear. It was great to get in some final runs, but it certainly made us realized we had hit our limit, and we headed back to the airport with some tired girls, excitedly anticipating their airplane screen time! What a trip. What a place. This felt like our first real vacation as a family where we all relaxed and enjoyed the experience and headed back home feeling tired, yet also rejuvenated and re-inspired. I’m so grateful to have grown up with these experiences and feel really blessed to be able to carry on the tradition with my family. Every adventure further solidifies our belief in experiences over things and we always return home feeling more inspired to put that belief into action, work hard, and enjoy our time together. What were your most memorable vacations when you were growing up? What has been your favorite family vacation to date? Why? What an absolutely amazing and fun vacation that looked like—I love your view on traveling! We have 2 year old triplets so my husband and I are dreaming of the year we get to start traveling like this and showing them some wonderful places! Right now, the beach is about all we have done just to keep it simple :). Wow what a fun trip! Loved reading about it! This was a great read. This seemed like so much fun!! It gave me a small glimmer of hope in life as right now I am in the thick of things with an 18 month old and a 4 month old. Right now, enjoyment like this just does not seem like it is anytime in the near future or EVER hahaha. This looks like such a fun and amazing trip. It also didn’t look very crowded which makes me very jealous. Tahoe is where I grew up snowboarding and it’s so packed there I don’t even really like going anymore. The lift tickets are now over $100/day which is not affordable for us to go. It might be worth checking out Utah in the future for ski trips. Thanks for sharing your vacation. Some of my favorite family trip memories are going camping every summer. As a kid there is nothing like sleeping outside. 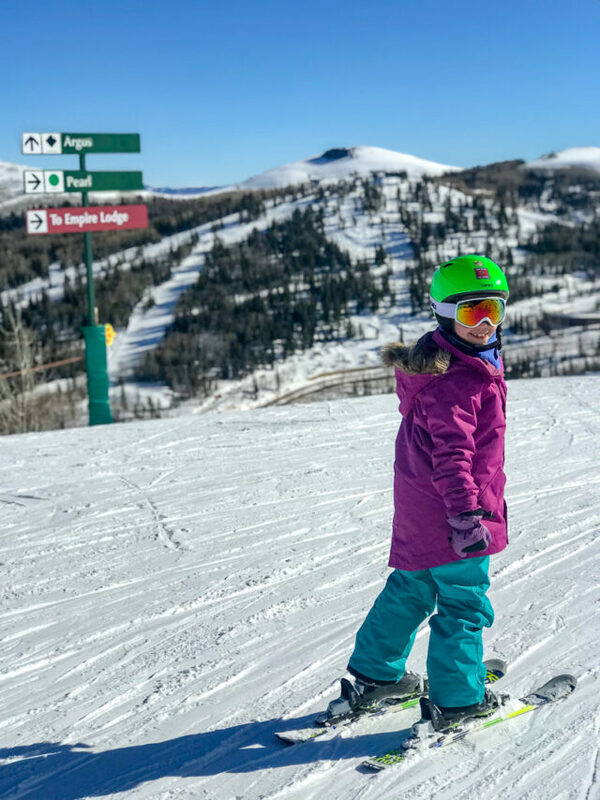 Deer Valley is actually known for their lack of lift lines because they limit lift passes and it’s truly incredible not to waste anytime in a line- especially with kids! They don’t allow snowboarders though (only 1 of 3 resorts that do that). Literally just forwarded this post to my husband to say WHEN CAN WE DO THIS? My husband and I vacationed at Snowbird (where he proposed) then we went back for our honeymoon. It would be great to go back but it is NOT family friendly. We are a few years away from a ski trip out west since our youngest is just about 17 months. 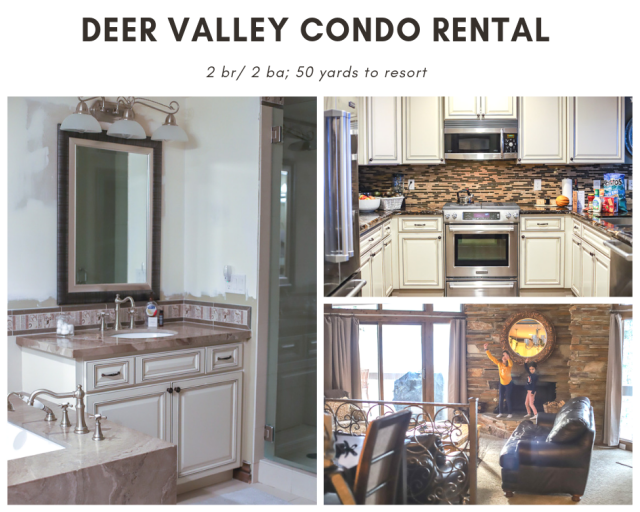 Park City and Deer Valley might be right up our alley. I would like to not have to eat out for lunch and dinner every day; what was the grocery service like? Thanks for such an in depth post. You did your usual good job of chronicling your wonderful Deer Valley trip. Such fun! Definitely reminded me of our wonderful family trips out West to ski. 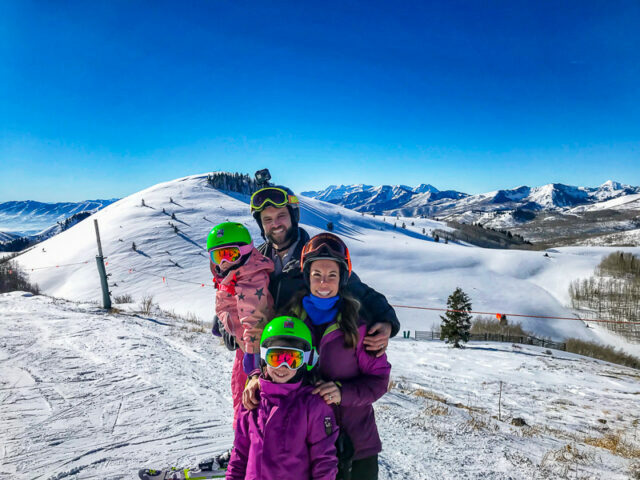 Glad you were able to enjoy the parent experience this time, kid, as we so much enjoyed our time with y’all on those slopes – and the hot tub! Again, thanks for sharing. It stimulated many fine memories in my brain. John J. Stathas recently posted..Are You Stuck In “Colder Weather” (Zac Brown wants to know)Do you know what “colder weather” means? Loved reading about your vacation, but had to skim over some of the food pics because it looked so amazing and I haven’t had lunch yet :). Long lift lines can definitely put a damper on things, so I’m glad you found a location that was not crowded! 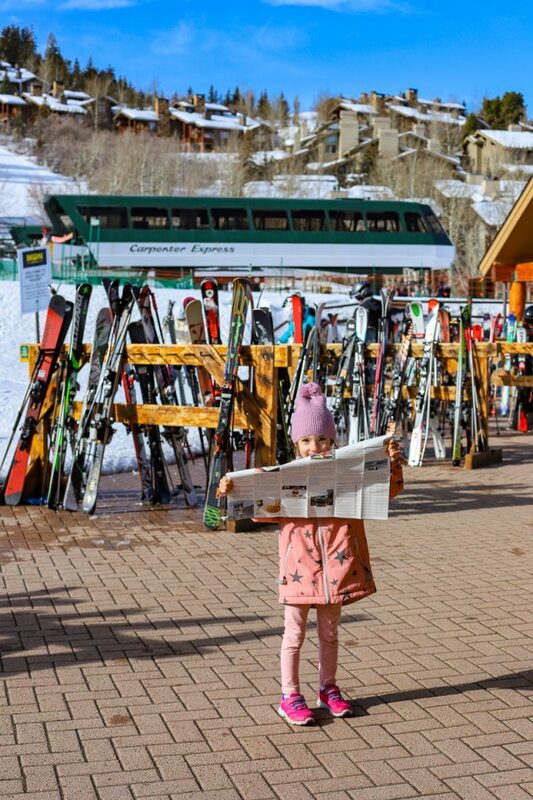 We have mostly stuck to the locals ski spots in Colorado, which don’t have any lift lines, but are a little more bare bones then the larger resorts that cater more to tourists. We have only gone cross country skiing with the boys (since it is free, and we can ski right from the cabin), but I am really looking forward to the next year or so when my youngest will be 3 and we can sign up for ski school (and hit the runs ourselves)! That definitely sounds like a smart splurge! My favorite are also the long blue runs (love a good 3 miler!) and the less technical tree runs. And so agree about a good buffet- golden for the kids and when on vacation! I can’t say I have one best family vacation, but in general any road trip/ national park trip we’ve taken has been amazing. We do at least one every year, and I collect the National Park brochures. I sat down to count it up, and couldn’t believe I’ve been to 28 of them already! The first one visited after having kids was Grand Canyon, and I remember being so amazed that adventure travel was still possible with a baby (6 months at the time). We hiked around Grand Canyon, Petrified Forest and Painted Desert, Mesa Verde, and Monument Valley (not a national park), and I was just thrilled. Since then, that is mostly what we have done (trying new national parks with each trip)! We’re back to Death Valley NP for a second time this March as part of our Nevada road trip, flying in and out of Vegas. Flying can be great, but I just love planning a good road trip as well! This trip sounds amazing! 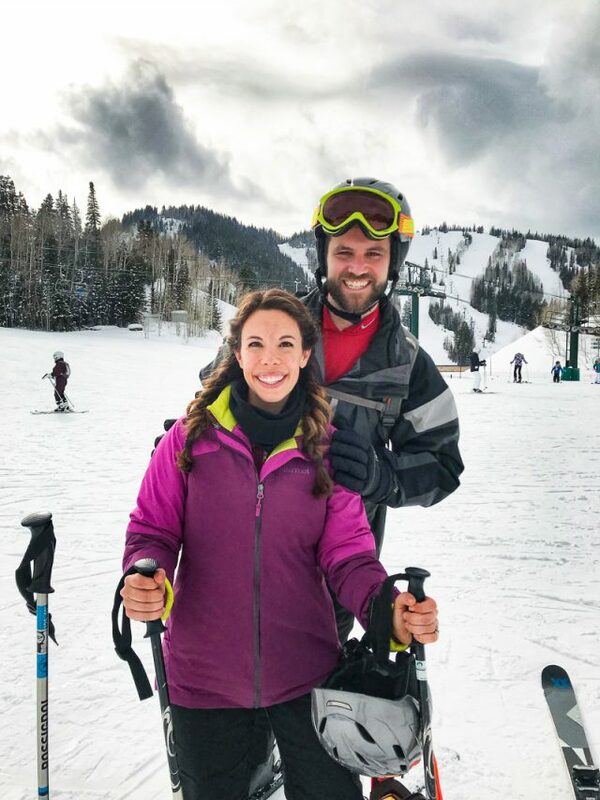 My husband and I met when we were both living in the Denver area, and back then we logged 20+ days/season on the slopes. My how things have changed after moving to NJ and having 2 kids! They are now ages 5 and 7, and both good skiers. We keep talking about when we will take them out west. Maybe next year? We of course would tend towards our beloved Colorado mountains, but this place sounds amazing as well! Thanks for the detailed recap. 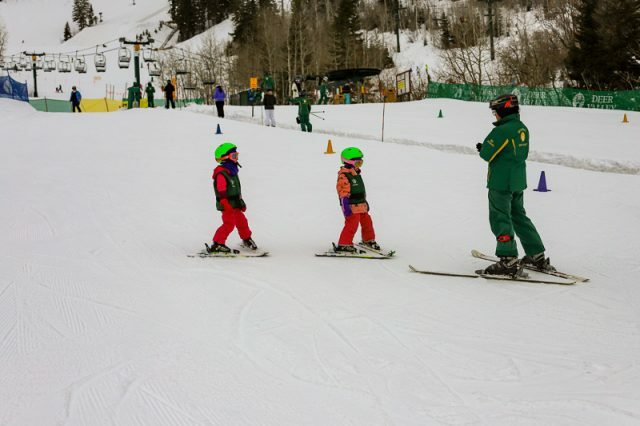 And I agree – little kids on skis is the absolute sweetest thing! I’ve been checking your blog daily waiting for this recap! So.much.fun! 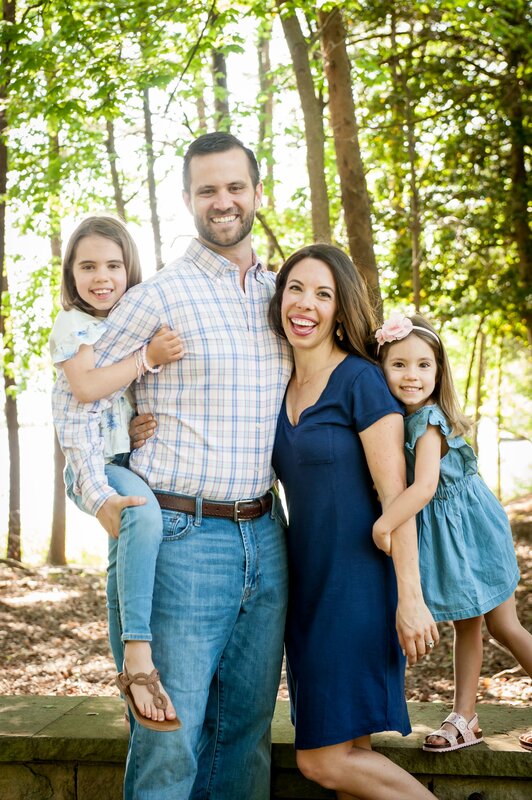 My kids are the same age gap as your kids (just over 2.5 years)….Liam is 4 and Natalie is 20 months….we’re getting closer to doing more vacations but we’re not quite there yet. I’m soaking in this baby time but also really excited to do vacations like this in a few years! How nice it is to be able to relax on vacation! We did Florida last winter and it was fun and full of memories but i came back more tired than when we left! haha! Thanks for sharing! Great recap and it sounds like an amazing vacation! I grew up skiing in northern Michigan and Canada, but have never skied on real mountain runs before. How fun! Random traveling with kids question, what did you do for car seats or boosters when you took Uber/Lyft? This is one of those head scratchers for me – do you bring your own backless boosters and just take them into restaurants and stuff with you? I’d love some insight for when we travel in the future! Thanks! I don’t know if my answer is the one you are looking for, but we just strapped the girls into the backseat with seat belts across their waists (not neck/shoulders). I imagine babies and toddlers are more challenging of a set up, but this worked for us for our short rides. That makes sense! After I asked the question, I searched and found some travel boosters on amazon so it’s good to know that’s an option. Our kids are 4.5 and 6 so we would probably do the same as you for very short rides. The long lines or waits at security on the way were probably due to the government shutdown. Growing up we (kids) always did half day ski school for the morning and then parents picked us up after lunch to ski as a family in the afternoon. 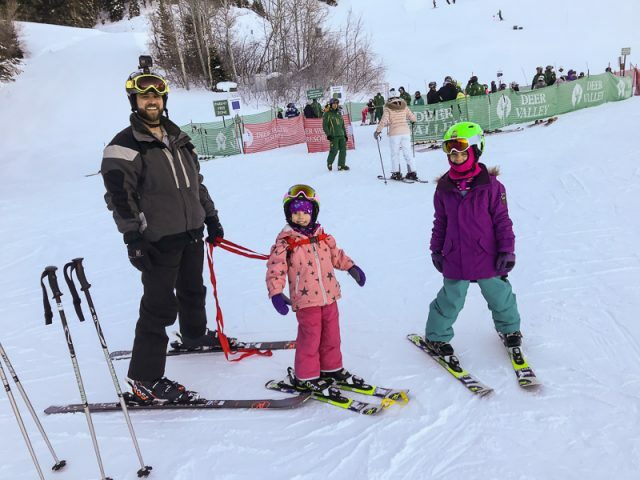 Planning to do the same with my kids…seems like a good balance of kids getting instruction and parents getting some alone time on the slopes but then doing it as a family too. I love that idea! Just be sure to check out the ski school first before planning. Not all have half day options (Deer Valley does not). Ooo great review! We just got back from Keystone. It was our girls’ first ski trip (4 & 6). 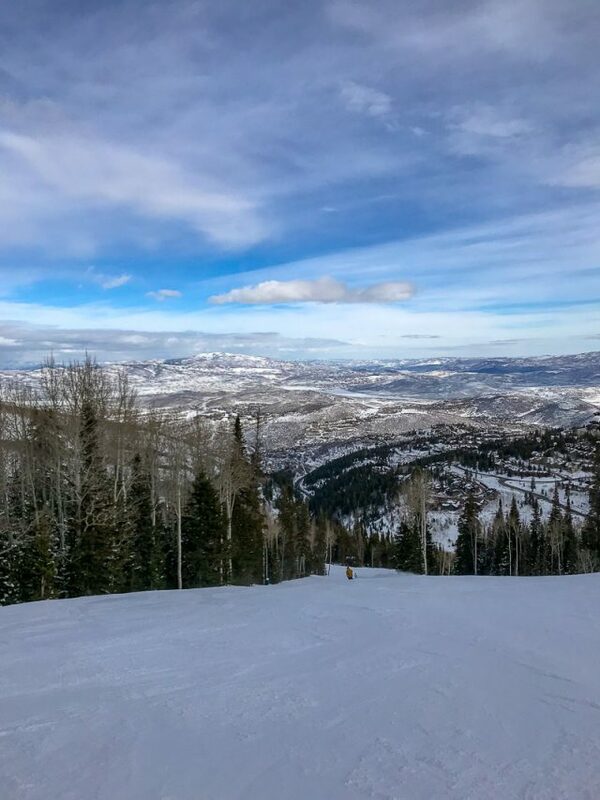 We live in Raleigh and after pricing out Snowshoe and cringing at the lodging cost, we found some cheap flights to Denver and went for it. Since we could just get an Airbnb I think it ended up being cheaper than Snowshoe. We loved Keystone. This was the kids’ first time on skis at all, so they did 2 full days of ski school and were snowplowing like champs by the end. Salt Lake is next on our list (husband and I LOVED skiing there pre-kids) but I’m not sure we’ve actually done Deer Valley. Snowbasin is our favorite. Also – for the folks who asked about Uber/Lyft – we use the Bubblebum booster for travel and it works pretty well. Oh that sounds and looks like such a wonderful time. We have started skiing on and off the past few years but usually just go to the local slopes. We are all still bunny hill people. But a ski getaway sounds perfect. I loved reading your post! That vacation sounds magical. 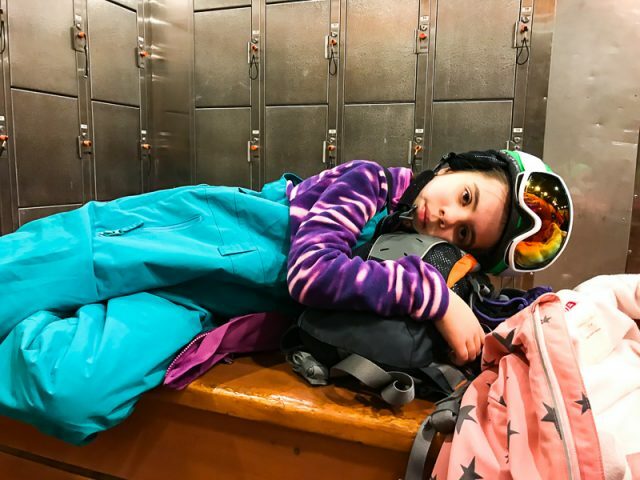 I have never been skiing and have always been too intimidated to try, but the resort you stayed at sounds so laid back and helpful, which is exactly what I would need. We live in Munich so obviously we have the mountains right at our doorstep. Neither my husband nor I are big skiiers but we just took our 7 year old for the first time to ski school last weekend and he loved it. This has inspired me to try to plan a family ski trip soon. 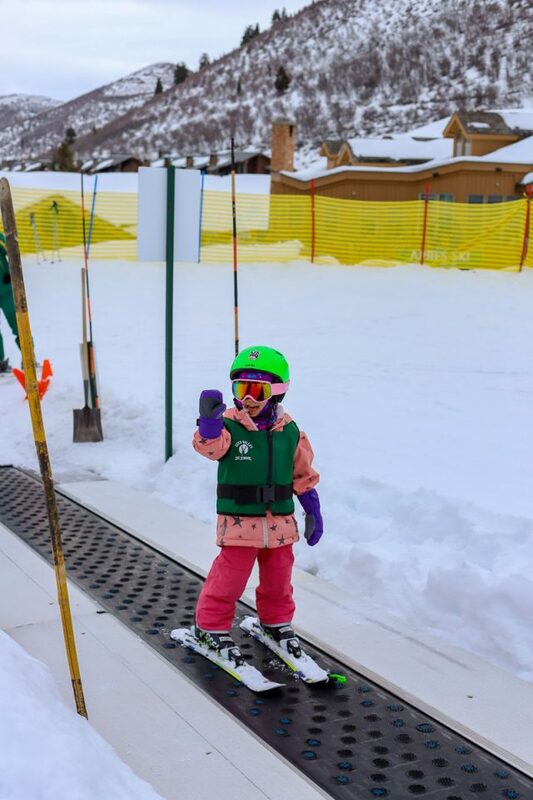 Our little guy (2) is still too small but in 1-2 years we may manage it (at the ski school there was a 2.5-4 year old group and it was the more adorable thing ever) Thanks for the wonderful recap!